A little over three years ago, on August 3, 2015, Prime Minister Narendra Modi announced the signing of a historic framework agreement to end the decades-old Naga insurgency. However, the peace accord is yet to be finalised — even though all stakeholders other than the Government appear keen on a conclusion. Many details of the 2015 agreement are shrouded in mystery — while Naga groups have given up the demand for sovereignty and redrawing of boundaries, issues like a separate passport, flag and army are still unresolved. A report appearing in the The Indian Express stated that the agreement was signed nearly 18 years after the Government’s ceasefire 1997 deal with Naga armed groups. While neither the Centre nor the Naga groups have been forthcoming with the details, the framework agreement did accept special status for the Nagas. There was an understanding on a settlement within the Indian federation, with due regard to the uniqueness of Naga history. In a recent submission before a Standing Committee of Parliament, the Centre’s interlocutor for the Naga talks, R N Ravi, said it was implied in the agreement that “some special arrangement” would be made for the Nagas. “On being asked what the special arrangement will be, the Committee was told that with respect to Nagaland there is already a special arrangement. Article 371A of the Constitution makes it very clear that they are special and a special status has been accorded to them,” states the report of the Committee, which was tabled in Parliament on July 19 last. The report further stated that the former Intelligence Bureau officer Ravi was appointed interlocutor in August 2014. The Nagas initially insisted on the unification of Naga-inhabited areas — “no integration, no solution” — but have now reached an understanding with the Government that current boundaries of northeastern States will “not be touched”. “Interlocutor… submitted that the negotiations were proceeding towards a situation, where boundaries of any State will neither be changed nor altered,” says the report of the House panel. 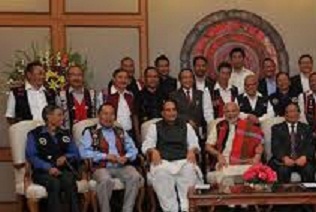 Besides the National Socialist Council of Nagaland (NSCN-IM), the Government held discussions with six other groups. The NSCN-K, which violated the ceasefire in 2015, was not part of the peace process. On November 11, 1975, the Shillong Accord was signed between the Government and a section of the Naga National Council (NNC), under which this NNC faction and the underground Naga Federal Government (NFG) laid down arms. A 140-strong group led by Thuingaleng Muivah refused to accept the Accord and, in 1980, formed the National Socialist Council of Nagaland (NSCN). With Muivah were his comrades Isak Chishi Swu and SS Khaplang. In 1988, the NSCN split into two groups, led by Isak and Muivah, and Khaplang. After NNC leader Angami Zapu Phizo died in London in 1991, the NSCN-IM came to be seen as the predominant Naga rebel outfit. The efforts for peace started soon after the NNC declared Nagaland an independent State on August 14, 1947. It took until August 1997, however, for the first ceasefire agreement to be signed between the Government and the NSCN-IM. The security situation in Nagaland and neighbouring States, however, remained grim, and the ceasefire was violated by both the NSCN-IM and NSCN-K. The NSCN-K unilaterally broke the agreement in March 2015, and was subsequently declared an unlawful association under The Unlawful Activities (Prevention) Act, 1967. The NSCN-IM dropped its demand of sovereignty after several rounds of negotiations with the Government. In the NSCN’s conception, ‘Greater Nagalim’ consisted of Nagaland and “all contiguous Naga-inhabited areas”, which included several districts of Assam, Arunachal Pradesh and Manipur, and a part of Myanmar. While the area of Nagaland in 16,527 sq km, Greater Nagalim sprawled over 1, 20,000 sq km. The demand for Nagalim has always agitated Assam, Manipur and Arunachal. Political parties and Naga groups had pressed for the finalisation of the accord ahead of the Nagaland Assembly elections last year. The framework agreement was signed with the NSCN-IM, which had threatened to pull out if the Government engaged with any other group. After several rounds of discussions, however, the NSCN-IM agreed to involve smaller groups, and six groups besides NSCN-IM are now formally part of the peace process. Delays were also caused by the demand for a separate flag and passport, and the question of the armed Naga battalions. With barely months to go for the Lok Sabha elections, it now seems unlikely that the accord will be finalised in this term of the Central Government.